Congratulations on the temporary withdraw of the Saltworks plan. Good work from Redwood City Neighbors United. 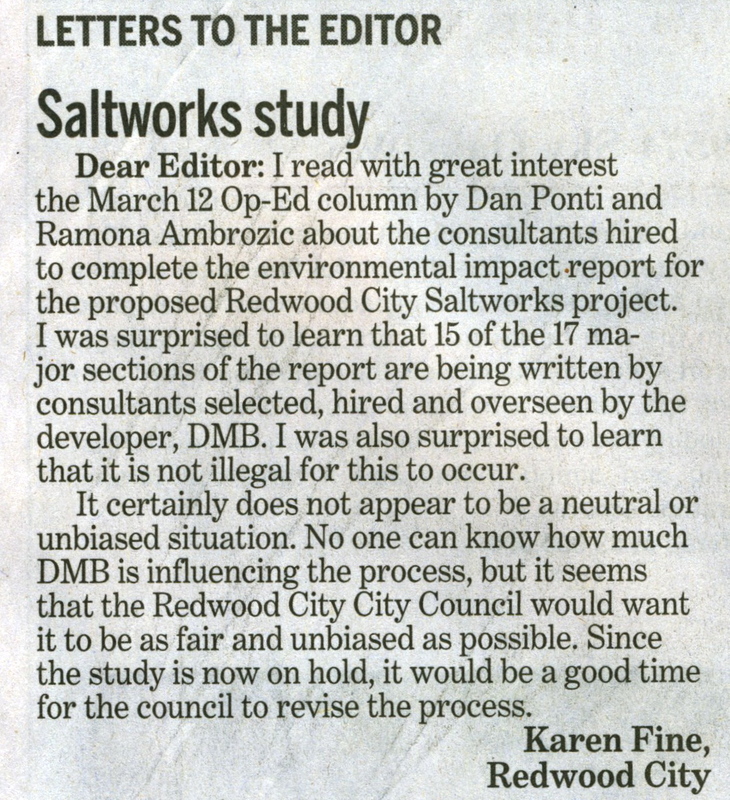 Stating she had been “thinking about it for quite some time,” Councilwoman Rosanne Foust asked her colleagues on the Redwood City Council to consider placing a measure on the November 2012 ballot asking voters about the proposed Cargill Saltworks property development. The issue at hand is the 1,436-acre Cargill Saltworks property located just off Highway 101 along Seaport Boulevard. The property has been used for salt production since 1901. Initially owned by the Redwood City Saltworks, it was sold to the Stauffer Chemical Company of San Francisco in 1905 and later to the Leslie Salt Company in 1941. Cargill purchased the Leslie Salt Company, including its Redwood City plant site, in 1978. At its peak, the Redwood City plant site produced and shipped 350,000 tons of salt annually. The Saltworks plan covers more than 2.2 square miles of industrial salt-harvesting property. Portions of the site have been in salt production for more than 100 years and the site is currently off limits to the public. The plan calls for 50 percent of the property to be preserved for permanent open space, public recreation and tidal marsh restoration and the remaining half be developed into housing, schools, parks and retail and transit facilities. The site could have up to 12,000 housing units. Since 2006, DMB Pacific Ventures has engaged Redwood City residents on the future on the Saltworks site. In 2008, Measure W asked voters to change the city’s charter to effectively stop the Saltworks project but was defeated. Also in 2008, Measure V asked voters; “Shall a Charter Amendment requiring majority voter approval for future development of the Cargill Lands, consisting of approximately 1,450 acres east of Highway 101 and south of Seaport Boulevard, with exemptions for takings and vested rights, be adopted?” It was also was rejected by voters. Since that time, the city has embarked on an extensive environmental review of the Saltworks site. In response to the significant amount of public input during the city’s review process, DMB notified city staff that they were evaluating future alternatives for the Saltworks site, which continues today. The announcement of the Saltworks plan was the start of a lengthy period of official study, evaluation and public review. The City Council will make final decisions on the development based upon the impacts and benefits to Redwood City. Foust asked the council to consider, “calling for an advisory vote on the project description” after the EIR is presented to the city. The council and city staff is currently waiting for the EIR to be completed. Redwood City Mayor Alicia Aguirre took exception to the group’s comments and responded in a letter. Foust is the chief executive of the San Mateo County Economic Development Association, also known as SAMCEDA, which has endorsed the project. Last year, Foust received a ruling from the state’s Fair Political Practices Commission that she acted in violation of state ethics rules when she participated in a decision regarding the project. She has since voluntarily recused herself from any council discussion of the project. A representative from Save the Bay, the environmental nonprofit strongly against the project, said it is premature to comment on Foust’s proposal. We have a “rough sense of what she said,” said Stephen Knight, political director of Save the Bay, about Foust’s proposal. The developer also has a wait-and see-approach. “We are considering the implications of giving voters a say on whether to undertake environmental review of a revised restoration and reuse plan for the Saltworks property and await details of what the City Council wants to do” said Jay Reed, director of Communications and Strategic Planning for DMB Associates, Inc. This is an “opportunity for you to lead, for you to actually step out and say this is what we need to do for our community,” Foust told her colleagues. Aguirre said she would look at the suggestion and put it on an agenda for a future council meeting to discuss. The Redwood City Council last night agreed by default to shelve the Saltworks development plan stalled for three years without a project description necessary to complete the application and finish environmental reviews of the controversial proposal. The council did not take any vote, however, as it was a moot point coming after developer DMB Redwood City Saltworks announcement last Thursday to formally withdraw its 50-50 balanced plan while working on a scaled-back option. Regardless, both the council and nearly two dozen members of the public took the opportunity to voice opinions on the proposal and future of the 1,436-acre site of salt ponds which preservationists want restored to tidal wetlands and that the developer, formerly known as DMB Associates, still plans to convert partially into housing. The packed house was informed early by Mayor Alicia Aguirre than no action would be taken and cautioned them to remain respectful. One female speaker did get a spontaneous chiding by Councilman Jeff Ira when she yelled “its time to oust Foust” — a reference to Councilwoman Rosanne Foust’s position as president of the pro-Cargill development San Mateo County Economic Development Association — and two police officers walked her from the podium. Several of the speakers urged the council to take steps to prevent the developer from taking another stab at a project no matter how it is configured, ticking off reasons including wetlands health, traffic congestion and incompatible land use. “We strongly urge you to add denial of application to the list of options to consider in the future,” said Gail Raabe, speaking for Redwood City Neighbors United which vocally opposed the original plan. Save the Bay, the environmental nonprofit that has led the public fight against the plan, echoed the sentiment. “Redwood City and the region hope this will be a permanent end to inappropriate development at this site,” said political director Stephen Knight. Knight said the group’s preference is that DMB donate the land for restoration like that done on Bair Island. However, resident Lou Covey did ask for an advisory vote, not on a specific plan but if development should be prohibited all together on the land. “I think that will finally answer the major question of what the people really want,” Covey said. The original proposal known as the 50-50 Balanced Plan called for reserving 50 percent of the land as permanent open space, public recreation and tidal marsh restoration and develop the remaining half into housing, schools, parks and retail and transit facilities. Up to 12,000 homes would have been built under this plan. However, DMB never followed with a specific project description on which the environmental review could be complete and last November said it planned to revise and resubmit its proposal. Without a plan or any idea of when might be coming, Foust last month suggested seeking an advisory vote from the public on what the city should do. Aguirre appointed councilmembers Barbara Pierce and Ira to look at the city’s options and Thursday released a report indicating that they would ask the council to ditch both the vote idea and the proposal outright. Hours after the council recommendation was released last week, DMB made its own announcement that it was withdrawing the proposal formally although it planned to return with a revised, scaled-back plan. John Bruno, senior vice president and general manager for DMB Redwood City Saltworks, reiterated that position last night. Bruno said DMB has “begun working diligently on a fully revised proposal” which he promised would be “a significant departure” on a much smaller scale while including affordable housing, parks and hiking trails. The new plan is intended to fit within the general plan’s area designated urban reserve and are set aside for future city expansion. DMB believes a scaled-back version of its plan would fall within these areas. Formally denying the proposal frees the city from time-consuming and costly functions like responding to constant public inquiries, polls, petitions and numerous other efforts for and against the controversial development idea, according to city officials. With Saltworks out of the way, too, city officials hope they — and the public — can focus on other big-ticket projects in the pipeline like the Stanford in Redwood City campus, the development of Depot Circle and the ongoing renovation of downtown. In other business, the City Council unanimously agreed to ban polystyrene-based disposal food containers and raised both sewer and water utility rates. The city received 32 protest letters against the water rate increase and 31 against the sewer rate increase, said City Attorney Pamela Thompson. The rate increases will add 12 percent to water utility charges and a $9.56-$115.76 sewer charge increase. Both go into effect July 1. Even though developer DMB Pacific Ventures formally withdrew its controversial Saltworks application last week, about two dozen people showed up at the Redwood City City Council meeting Monday night to give their two cents’ worth about the project, and then some. “We are united in our opposition to the Saltworks project no matter how it is ultimately configured,” said Nancy Arbuckle, a member of Redwood City Neighbors United, which has drawn the battle lines against any development of the former Cargill salt flats east of Highway 101, just south of Seaport Boulevard. Council Member Jeff Ira said dropping the Saltworks application for now while awaiting a revised version to be submitted hopefully will “put an end to some of the divisiveness” and allow more focus on “the great things that are happening in Redwood City.” Arbuckle said the divide was not between residents, but against DMB. The council was scheduled to consider rejecting DMB’s application, but that became moot when John Bruno, the company’s senior vice president, submitted a letter to the city Friday indicating the development would be significantly scaled back and primarily centered on the side of the 1,436-acre Cargill site that runs parallel to Seaport Boulevard and has been used more than 100 years for salt harvesting and other industrial activities. The proposal DMB submitted three years ago would have encompassed almost the entire property. The so-called “50/50” plan envisioned as many as 12,000 homes, offices, shops and schools on half the site, and parks, recreation areas and restored tidal marshes on the other half. DMB withdrew a project description of that proposal in November, saying it intended to make revisions based in part on public feedback. That footprint falls within 542 acres of Cargill property that Redwood City’s general plan has designated as “Urban Reserve,” defined as “Land to be preserved for future use to expand the limits of the urbanized area of the City,” according to Bruno’s letter. Bruno told the council Monday night DMB remains “committed to being thoughtful and thorough in developing our revised Saltworks proposal.” Most of the speakers who addressed the council said they oppose the project in any form. 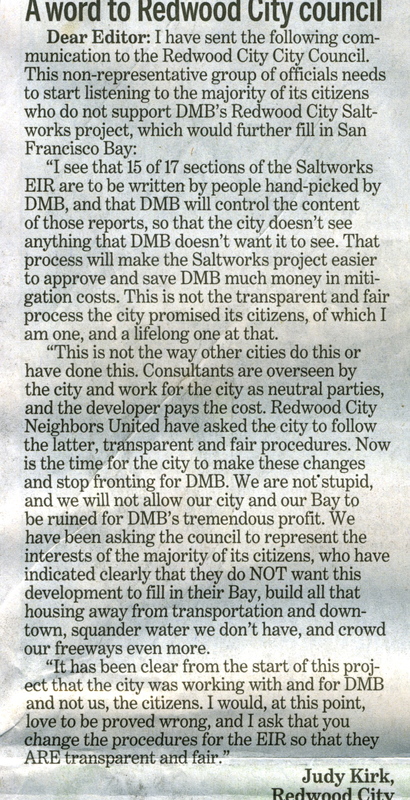 Stephen Knight of Oakland-based Save the Bay urged the council to tell DMB to forget about returning with another proposal. “That will only reignite community outrage,” he warned. Resident Lou Covey was among a handful of speakers who said the city should be open to an alternative proposal and advocated for an advisory vote — not on whether the Saltworks project should be considered, but to see whether residents are willing to allow anything on the Cargill site. “Should development be prohibited altogether on the Saltworks property?” Covey suggested the question should be. Council Member Ian Bain said now that the project has been dropped, the city should have a community discussion about what “they’d like to see on that site.” When the city drafted its general plan a few years ago, the Cargill property was excluded because it otherwise would have “hijacked” the planning process, he said. In other action Monday night, the council approved a 12 percent increase in water rates and 9 percent jump in sewer rates for the 2012-2013 fiscal year, which begins July 1. Both rates already rose by 9 percent in each of the last two years. Due to the latest increases, residential customers will pay from $4 to $27 more per month for water, depending on their household usage. Residential sewer rates will go up by about $5 a month. The boost in water rates is needed in part to cover projected increases in wholesale water costs from the city’s provider, the San Francisco Public Utilities Commission, according to city officials. They say the extra money also is needed to improve and maintain the city’s water system, sewage pipe system and the sewage plant Redwood City shares with Belmont, San Carlos and the West Bay Sanitary District. The council also adopted an ordinance that will ban restaurants and other food vendors from using disposable polystyrene foam food ware within city limits. The new law won’t become effective until Jan. 1, although the city said it will encourage businesses to voluntarily comply before then. Because the Redwood City ordinance is modeled after one passed by the San Mateo County Board of Supervisors in 2011, the county will help do outreach work and will enforce the ban. A first violation will bring a $100 fine, a second one $200 and a third $500.